The good news is that I finished my quilted jacket and I am in love with it. The bad news is that I finished it on a cloudy Sunday afternoon, and with the sun setting so early now, I couldn't get any daylight pics. So my review will have to wait until next weekend. Until then, I'm focusing on my first Marfy! Cindy started a Marfy sewalong on Pattern Review, and since I've heard nothing but great things about Marfy, I decided to give it a try. My pattern arrived on Saturday. It's shipped direct from Italy, and someone needs to sign for it when the mailman delivers. 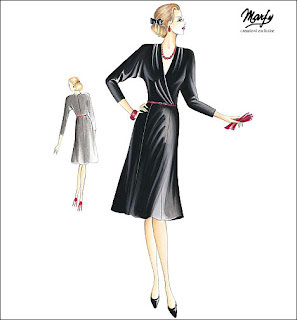 I ordered mine from McCalls, you can also buy them from Butterick, or Marfy directly, of course. Vogue used to sell them but for some reason they're not on the site now. Like vintage patterns, each envelope contains just one particular size. Instructions are not included. Neither is a line drawing; you'll have to refer to the online fashion illustration or your catalog for clues regarding construction. I figure having used BWOF is like training-wheels practice for Marfy. The pattern is pre-cut, and while the pieces are not labeled (i.e. right front bodice, back skirt), other relevant information is stamped, like pleat markings and matching seam lines. 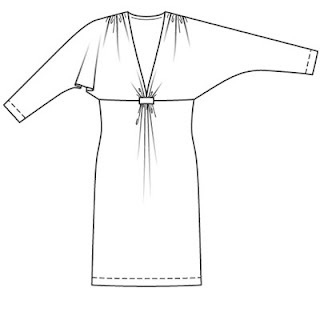 Both have 3/4 dolman sleeves, gathering at the shoulder seam, a V-neck, a waist seam, and a knee-length skirt. This wasn't a conscious decision. Apparently I like this style! So besides checking the fit, I shouldn't have any problems sewing this one up. That looks like it will be nice! Can't wait to see the finished product. Well good luck with this. I think I would stick with something very simple too if I were trying Marfy for the first time. I have yet to try a Marfy pattern! I'm sure you'll do a wonderful job! Can't wait to see your dress! These days I sew pretty much nothing but Marfy patterns; once you get the confidence to sew without instructions they're pretty easy to do, plus they fit beautifully and I rarely have to make any adjustments. Thanks for introducing me to Marfy. Love learning something new! This is an exciting project! Have fun with it. I know you are going to look amazing in this dress. How exciting! I'm still scared of Marfy.. but can't wait to see yours all made up! The ideal of getting a pattern with no tracing or cutting out would be fabulous and save time.. so there would be more time for actual sewing! The dress is very stylish with a wonderful flow, is it made for knits? Cool. I'm interested in seeing how this turns out! Hi Johanna - Yes, it's made for knits, and I am especially thrilled because I found the perfect fabric in my stash. Is a seam allowance added to the pattern, or do you have to create your own? Hi Krystal - The SA is not included, you add it yourself. Ooh, thanks for all the pics of the pieces! Very interesting. I'm wondering if it actually is faster to have no sas. I made the Burda dress after I saw yours in the blog (and recieved many compliments!) but have not yet tried Marfy. I have a friend who is bringing me Patrones Magazines back from Spain which seems to present the same sort of problems if you are not a spanish speaker/reader! I am having fun with their Fiesta issue at present - lots of fabulous garments but no real idea howw to make them. Its like working with a jigsaw with no picture. Good luck with the Marfy!